Amun was the Egyptian god of the air, sun and the sky. Originally, Amun was depicted with red-brown skin. However, following the Amarna period and the religious revolution involving the god Aten, his cult revived and he was painted with blue skin, symbolizing his association with air and primeval creation. 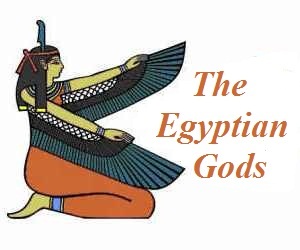 Titles: "King of gods", "Mysterious of form"
As the religious beliefs and culture of the Egyptians developed some of their ancient gods were subsumed (meaning absorbed) into new gods. The practice of creating new gods by combining them with old gods is called 'syncretism', which meant the fusion of religious beliefs and practices to form a new system. 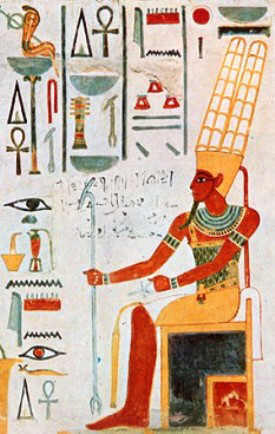 Atum was first worshipped a minor, local god. He then became a member of the eight gods collectively called the Ogdoad of Hermopolis. Religious cults provided the base of ancient Egyptian religion. The names of the cults indicated the number of major gods worshipped in the cult and the location of the cult center. The Ogdoad of Hermopolis (Khmunu) consisted of 4 female-male pairs of aquatic gods, the goddesses in the form of snakes or cobras and the gods as frogs. 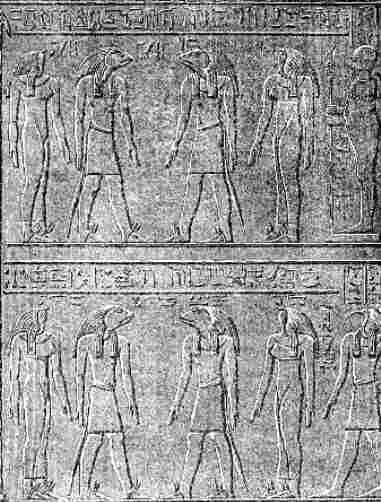 The eight deities, the Ogdoad, were worshipped in Hermopolis during what is called the Old Kingdom between 2686 to 2134 BC. Amun then emerged as a member of the three gods referred to as the Triad of Thebes. The Triad of Thebes consisted of Amun, his consort Mut and their son, Khonsu. Originally, Amun was depicted with reddish-brown skin. However, following the Amarna period and the religious revolution involving the god Aten, his cult revived and he was painted with blue skin, symbolizing his new prominence and association with primeval creation. His prominence was such that he was also merged with the fertility god, Min, to form the god Amun-Min. During the period known as the New Kingdom (1570 BC - 1070 BC), Amun became the national god of Egypt and head of the state pantheon merged with Ra, the sun god as Amun-Ra. The status of Amun drastically changed during a religious revolution when the Pharaoh Akhenaten established the sun god Aten as the only god of Egypt. The people of ancient Egypt was forced to change from a polytheistic religion (the worship of many gods) to monotheism (the worship of one god) The Pharaoh Akhenaten used the might and power of the Egyptian military to destroy the old religion, its gods and and the powerful priesthood. The worship of Amun as the national god was was particularly targeted. The Temple of Karnak located in Thebes and dedicated to Amun was closed and the priests were thrown out and Akhenaten ordered the statues of the old gods to be destroyed. Aten was worshipped for 16 years from 1349BC - 1333BC until the abdication and death of Akhenaten. The son of Akhenaten was Tutankhamen. The boy king became the Pharaoh and was forced by the influential and powerful priests of Amun to abandon his home in Armana where they attempted to obliterate all traces of Atenism and Akhenaten. The new, young pharaoh changed his name from Tutankhaten to Tutankhamun and to returned to Thebes and the old religion with Amun as the chief deity. Major construction work in the Precinct of Amun-Ra took place during the Eighteenth dynasty, of the period in Egyptian history called the New Kingdom (1570 BC - 1070 BC), when Thebes became the capital of the unified Ancient Egypt. 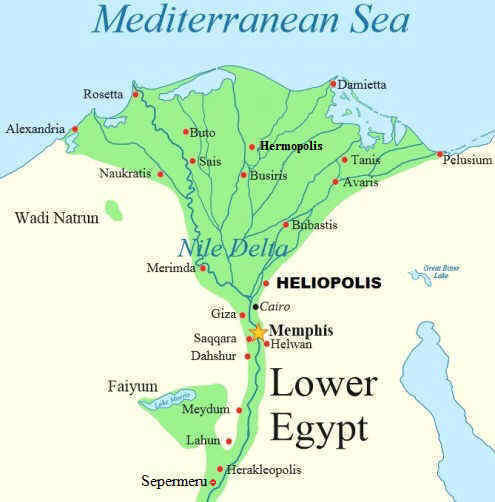 By the end of the period of the New Kingdom Thebes became known as as "Niwt-imn" meaning "The City of Amun." The symbols of Amun were the Amun crown and the ram headed sphinx. 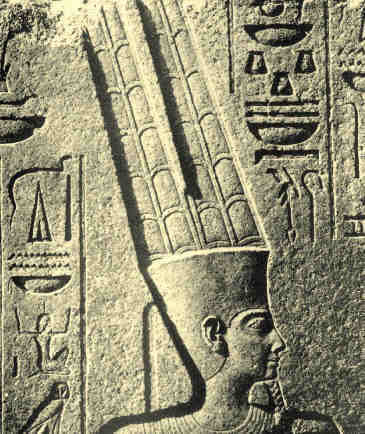 The Amun Crown consisted of a flat-topped cylindrical crown base (called a modius) that was topped by tall, double ostrich feathers. The ostrich was symbol of creation and light. The Amun crown was another style of the Shuti headdress, specifically associated with Amun although it was originally associated with the god Min. The ram headed sphinx is a potent symbol of fertility and Amun is sometimes referred to as "lord of the two horns". 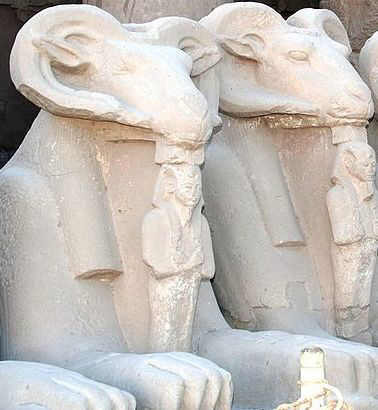 The processional road to the Temple of Amun in ancient Thebes (now Luxor) was flanked with ram headed lion sphinxes, each one guarding between its front legs a statue of the pharaoh. There were 900 statues of the ram headed sphinx at Thebes. The ram heads represented Amun and were depicted with the body of a lion (never winged), the hooves of a ram or a goat and the head of a ram. 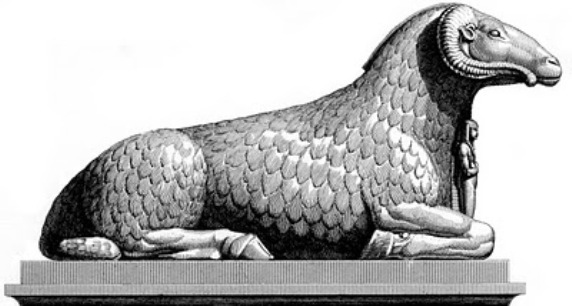 The ram headed sphinx is called a criosphinx whereas the human-headed sphinx is called the androsphinx. The 'Crio' in Criosphinx comes from the Greek word "Krios" meaning ram. Great avenues of guardian sphinxes lined the approaches to tombs and temples. The ancient Egyptians were not allowed inside the temples and the ancient Egyptians would therefore petition the accessible statues of Amun on the ram headed sphinx with their requests. Discover interesting information and research facts about Amun, the Egyptian god of the air, sun and the sky. The facts about Amun provides a list detailing fascinating additional info to increase your knowledge about Amun in Egyptian Mythology. Fact 1: Records relating to the New Kingdom show that the priests of the Temples dedicated to Amun had over 80,000 people working for them and owned enormous amounts of land, cattle and hundreds of ships. Fact 3: The cult centers to which he belonged were the Temple of Karnak at Thebes and Hermopolis Magna. Fact 4: The Amun priests owned two-thirds of all the temple lands in Egypt and 90 percent of her ships plus many other resources. Fact 7: In 1331 BC, following the death of the Pharaoh Akhenaten, there was a growing backlash against Atenism and the cult center at Armana was abandoned. Fact 10: A great statue of Amun was conveyed by boat from the temple of Karnak to Luxor during the Opet festival, in order to celebrate his marriage to Mut. It was called the ‘Beautiful Feast of the Opet’ and held during the second month of Akhet, the season of the inundation. 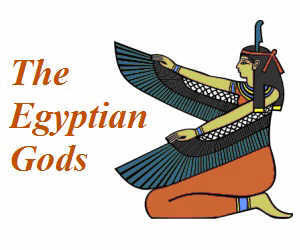 Fact 11: Amun's priestesses, the Wives of the God, were also called the Hands of the God.